The Heavyweights- Now or Never? The 28th of November, 2015. Just another date in history to most but for boxing fans it marked a “changing of the guard” or at least that’s what they hoped. When Tyson Fury met Wladimir Klitschko, the dominant force of Heavyweight boxing for a decade, at the Esprit Arena, Dusseldorf for the WBA (Super), WBO, IBF, IBO & Ring Magazine Championships it was seen as yet another routine defence for Klitschko. What followed was one of the most unexpected and shocking turn of events in the blue ribbon division for some time. By the end of twelve rounds there was nobody in any doubt that Fury had done the unthinkable, he had made believers out of the doubters and, like it or not, cemented his name in the annals of time. He ended the seemingly unstoppable reign of Wlad with a comfortable twelve round unanimous decision and left fans and experts alike wondering what was next for a division that had laid stagnant and dormant for far too long. Unfortunately, as is usually the case with boxing, out of ring chaos ensued. First was the sad debacle of the IBF stripping Fury of their prized bauble for refusing to defend against mandatory challenger Vyacheslav Glazkov and pursuing a rematch with Klitschko instead. Fury’s well documented and highly publicized personal problems were soon to follow. The new king of the heavyweights never got the chance to defend his crowns as a failed drugs test and mental health issues put paid to that. All his accolades were taken from him, although his achievement last November will never be, and set in motion the championship merry-go-round that is very reminiscent of what fans witnessed back in the 1980’s. For some this is an exciting time. There are several fighters now coming to the forefront, opportunities are available for so many heavyweights that may not have gotten the chance otherwise, but is it just another pathway to obscuring who the best in the division really is? With Fury, WBC Champion Deontay Wilder and IBF Kingpin Anthony Joshua all at the top of the tree it seemed obvious what needed to happen but suddenly two world championships have become vacant and the WBO & WBA respectively have decided, for whatever reason, it’s only right that more boxers be brought into the fold. So December 10th undefeated New Zealander Joseph Parker (21-0 with 18KO’s) will clash with America’s Andy Ruiz Jr (29-0 with 19 KO’s) for the WBO Championship. Both men are talented and exciting to watch but neither is tested at the highest level. This is a very fan friendly and intriguing fight but is it really world championship worthy? In an ideal world this would be a perfect final eliminator, whilst does anybody actually have the time to explain the WBA’s way of thinking? Earlier this year the decision was made by the WBA to clear up their “super” champion and “regular” champion mess that they themselves have created over the years. In some weight classes they have done an adequate job whilst in others, primarily in the land of the giants, nobody has a clue what is going on. The WBA “Super” Championship is vacant whilst the WBA “Regular” Championship was held by, now, disgraced and two time drug test failing Lucas “Big Daddy” Browne. The logistics and standings of both belts are now way up in the air. The logicial (I know that’s a laughable word in boxing) decision would be to allow Anthony Joshua and Wladimir Klitschko to clash next year (should Joshua remain unbeaten) for the WBA belt and just dump the “regular” belt and it’s attempted tournament to crown a champion in the trash where it belongs. But we are already hearing that Shannon Briggs, at 44 years of age, is being lined up to fight for that strap against a as of yet unnamed opponent. The Shannon Briggs story is yet another question mark on boxing. On a personal level I find Shannon entertaining and endearing, he deserves massive credit for getting himself in such incredible shape after ballooning in weight, but how on earth is he on the cusp of world honours? This is through no fault of his own, the catchphrase of “Let’s go champ” has certainly gone viral and his rapport with fans is admirable, but surely that isn’t a reason to make him a contender? He hasn’t fought a credible opponent in six years when he took a 12 round shellacking at the hands of Vitali Klitschko and yet as fans we are supposed to suspend disbelief and reality in order to swallow the garbage we are being fed? There are a growing list of names in the division that could provide entertaining fights and events for the fans but that does not mean that these men should be bordering on the verge of being named world champions. On these shores the announcement of David Haye vs Tony Bellew has certainly got people talking, the pre-fight antics are sure to be must-see television, but the ramifications are practically non-existent when it comes to sorting out who the best is. For Haye should he win, the general consensus being he should and early, then all he has done is settle a grudge with a Crusierweight who dared question his inability, or unwillingness, to step inside the ring with a fully fledged gladiator of his own ilk. Haye is somewhat of an enigma and a cause of much disgruntlement in the boxing fraternity. His explosive speed and power make him a serious threat for any fighter, in my personal opinion there are very few who could defeat him when he’s on song, but enticing him into competing against the elite is nigh impossible. He is the epitome of high risk and very little reward in the eyes of many. Should Bellew win it’s unlikely he’ll remain in a division where he’ll forever be giving away major height and weight advantages. Dillian Whyte and Dereck Chisora will collide on December 10th, also ,for the British Title and a WBC eliminator. Whyte has world goals of his own whilst Chisora is attempting to roll back the clock and convince anyone he still has something to offer, when very few believe it. Whyte has decent attributes but again we have to ask how good really is he? One good shot on Anthony Joshua doesn’t make him a credible threat to the big boys, he was very much outgunned and outclassed for the other six rounds before being knocked out, so bigger tests are extremely necessary before his name can be added to the chasing pack. David Price’s right hand keeps his name in the mix but unless he and his team get him a big win soon then he’ll fade into the abyss and then there is Hughie Fury, cousin of Tyson, who needs a big 2017 to build on the potential he has shown so far. Hughie has had a few medical problems but he’ll be back next year and a potential clash with Deontay Wilder has been mooted. Personally, I believe Hughie needs a couple of fights before that kind of challenge but his family have shown they have a knack for upsetting the odds. There’s no reason Fury, Whyte & Price cannot be pitted against one another in the near future. Across the Atlantic there is Gerald Washington (18-0-1 with 12 KO’s) and Jarrell “Big Baby” Miller (18-0-1 with 16 KO’s) carrying the hopes for America as they attempt to re-establish dominance in a division they dominated for so much of history. But like their British counterparts these men need competition. It’s passable for awhile, in the name of “learning”, to allow them to feed on victims but then it becomes tedious and quite harmful in the development of the fighter. Both Miller and Washington could be enticed to England or vice versa for the right money to be pitted against other contenders like the ones listed above. Showtime, HBO, Matchroom Boxing & Boxnation (now backed by BT Sports) have the resources available to make these contests happen and there should be increasing pressure on them to do so. The Heavyweights have always captured the public interest and now is the time for them to do so again. Luis “King Kong” Ortiz is signed to Matchroom now and Eddie Hearn is promising us big fights for the Cuban who was touted as the “sleeper” of the division. After watching the disastrous and embarrassing “fight” with the lamentable Malik Scott a couple of weeks ago he needs to make a big statement soon in order to stop the rest of us going to sleep on his career. European Champion, Kubrat Pulev is another competitor who’s name continously floats around the upper echelons but the Bulgarian former world title challenger is scheduled for a very head-scratching tilt with Samuel Peter this weekend. Answers on a postcard? On the 17th December former WBC Champion, Bermane Stiverne and former WBA title holder Alexander Povetkin will square off in an interim WBC Championship bout (the winner set to meet Wilder early next year) and these are the fights the fans want to see. #1 and #2 challenger scrapping for the opportunity to meet the champ. Whether you agree with the rankings system or not (unfortunately they have been made a mockery of over the years) the powers that be leave a little less chance of scrutiny if they push the best available against the best available, it’s all we as fans really ask for. Stiverne and Povetkin still carry weight and will pose plenty of risk to a champion who is required to defend against them. Which brings us onto another problem that we hoped had been solved a year ago. For years Wladimir Klitschko was chastised and lambasted for defending his belts in Germany against lacklustre opposition so when Tyson Fury carried the belts out of Dusseldorf it was believed we would now get to see champions defending against the hungry lions now circling the pride lands. However that isn’t quite how it has worked out. For many Anthony Joshua (17-0 with 17 KO’s) is the man to beat and there are good reasons to support that claim. He hasn’t put a foot wrong yet in his professional career, the Olympic Gold medallist seems to be getting better with each fight, but the fact remains he is a world champion now and no matter how hard his management team try to sell it Eric Molina is not and never has been worthy of a world title challenge. He wasn’t worthy to face Deontay Wilder last year, Wilder is not adverse to criticism here, and he most certainly shouldn’t be stepping into the ring with Joshua on December 10th. Go back and read through this article and you will find a dozen names of fighters more deserving of the chance, you and I both can probably name another dozen after that, and this is where we as fans are being short changed. This is billed as a PPV fight and yet anyone who is being honest knows it is anything but. Mike Tyson, Lennox Lewis, Evander Holyfield and Riddick Bowe in any kind of contest against one another was PPV, Ali, Foreman and Frazier were PPV……..this fight is barely worth column inches. It’s a shame because Joshua is a likeable man with a devilish side to him in the ring that could seem him become a global megastar. Perhaps one day his name will be uttered in the same breath as some of the greats but in a competitive, perhaps not hugely talented, division his level of opposition needs to dramatically improve. Your casual fans, boxing needs them, will lap up whatever you throw at them as long as it has a fancy VT package and Joshua’s name attached to it but the die-hards and those in the know can only stomach so much before they turn away just like they did during the last era. We are on the cusp right now. The opportunities are there for promoters and fighters to turn this new generation into one that will be remembered and applauded but they cannot afford to keep making the same mistakes of the past. I am by no means suggestion this current crop of heavyweights are a match for the greats of time gone by but they are competitive and if marketed correctly that provides entertainment, which is ultimately what this business is all about. 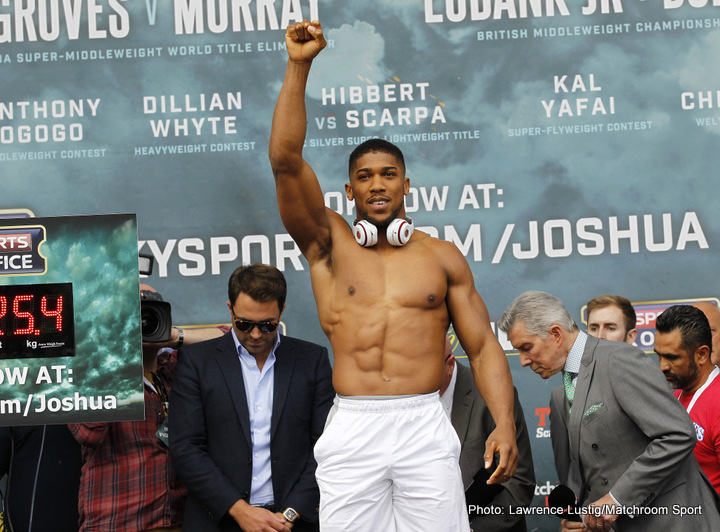 You are here: Home / Boxing News / The Heavyweights- Now or Never?